Some trees, for some people, are stuck using lod textures that are very low resolution. It's noticeable wherever dark green trees are present. This mod fixes the issues and returns the trees to their normal resolution. Just do anything with it. I take no responsibility. It's a simple fix. Like what you see? You may want to look at my small HD project for Dark Souls. Or my LoD Overhaul for Skyrim. 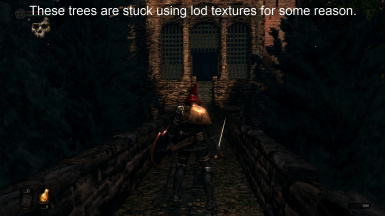 In vanilla Dark Souls some trees, for some people, are stuck using lod textures that are very low resolution. It's noticeable mostly around Sen's Fortress and in the Darkroot Garden region. Some people report that it can also occur in the Painted World. This mod fixes the issues and returns the trees to their normal resolution. As a nice side effect, your lod trees will now look better, so this also counts as a graphical mod as well as a bug fix. All normal tree textures have now been added, as far as I can tell. If you see something I missed leave a comment and I'll get on it as soon as possible. If you run into a problem or want to leave feedback message me or comment. The Painted World textures are up now. Hopefully that means there are no more instances of this bug. Due to the sporadic nature of this bug, it's often possible to miss this bug. It only shows up in certain circumstances which are described below. 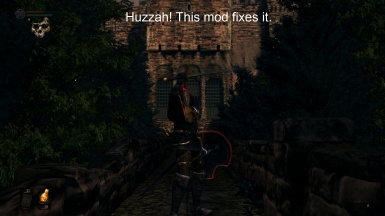 If you like this mod, please consider returning to endorse or comment. Feedback is what makes it worthwhile to post mods and continue to support them. It's not necessary to read this last part unless you're interested in what might be causing this bug and when it can happen. Okay, clearly some trees are using their lod textures. However, I found that this bug is sporadic. If you load a game when you're already within the Darkroot Garden, Sen's Fortress, or any other location that uses these trees, they're fine. This bug only occurs if you load the game in another area (such as the Firelink Shrine, Catacombs, etc), and then run into an area that uses these trees. Presumably the game does not unload certain lod textures correctly once they're loaded. Once this bug occurs, it can be temporarily fixed by reloading your game while standing in an area that uses these trees. The bug will occur again if you leave the area on foot and come back much later after restarting the game. I'm not sure why this occurs, but it might have something to do with the tree meshes specific only to the dark green trees. As far as I know, it does not happen to anything else in the game besides the model(s) of dark green tree, and to snowy trees with a similar texture that presumably use the same mesh. It doesn't happen to the light green trees, or to anything else, so it's reasonable to assume that the dark green trees and their snowy versions share a mesh which causes this issue. It's fixed now anyway.